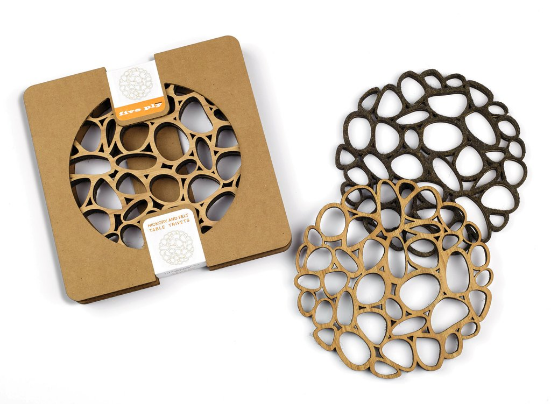 A Set of Two 8" Table Trivets by Five Ply Design of Seattle, WA are made from a composite wood core with American White Oak Hardwood on one side and 100% Post-Consumer recycled natural Wool Felt (75% recycled wool and 25% recycled carpet scraps) on the other. The 1/4" thick wood has been sealed with a LOW-VOC natural oil and the 1/16" thick Felt is raw and unfinished. The TableTrivets are heat tolerant and water resistant but not water-proof. In addition, all of our packaging has been designed to be 100% recyclable.